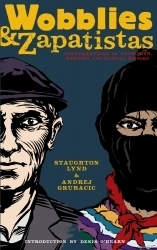 Andrej Grubacic is an anarchist from the Balkans. Staughton Lynd is a lifelong pacifist, influenced by Marxism. They meet in dialogue in an effort to bring together the anarchist and Marxist traditions, to discuss the writing of history by those who make it, and to remind us of the idea that "my country is the world." Encompassing a Left libertarian perspective and an emphatically activist standpoint, these conversations are meant to be read in the clubs and affinity groups of the new Movement.